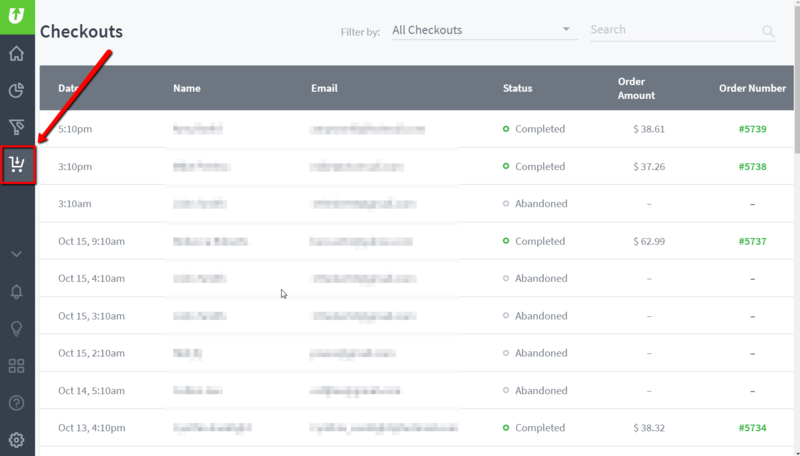 The "Checkouts" section will allow you to see real-time data (Date, Name, Email, Status, Order Amount and Order number) for all customers who passed the first step of the OCU checkout. *Note: In order to be added to this table, the customer will have to enter in their email address and contact info and then click the "continue to shipping method" button. Otherwise, no data will be captured and they will not be added. In Progress - The customer is currently in the process of checking out on the OCU checkout on your store. Abandoned - The customer has 30 minutes to finish their checkout, otherwise their status will be marked as "Abandoned". - It's required to have a supported CRM system connected to the OCU app for the "Abandoned" status to show. Until then, even if the checkout is abandoned the status will remain as "In Progress". 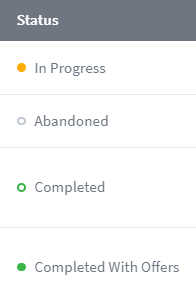 Once a supported CRM is connected then "In Progress" status will be changed to "Abandoned" for all new checkouts. - The customer needs to actually close the tab/window for their status to update to "Abandoned". If they leave their browser window/tab open on the OCU checkout page then their status will remain as "In Progress". Completed Order - Orders which are completed within 30 minutes will be marked as "Completed Order". Completed With Offers - The order was completed AND had upsell/downsell offer(s) purchased as well. Note: The Date column is determined by the time zone set in the Settings > General section of your Shopify admin. You can also use the "Search" field to search for a specific customer's name or email.